After all these years this is my first 'grandchild'....my very first pup. 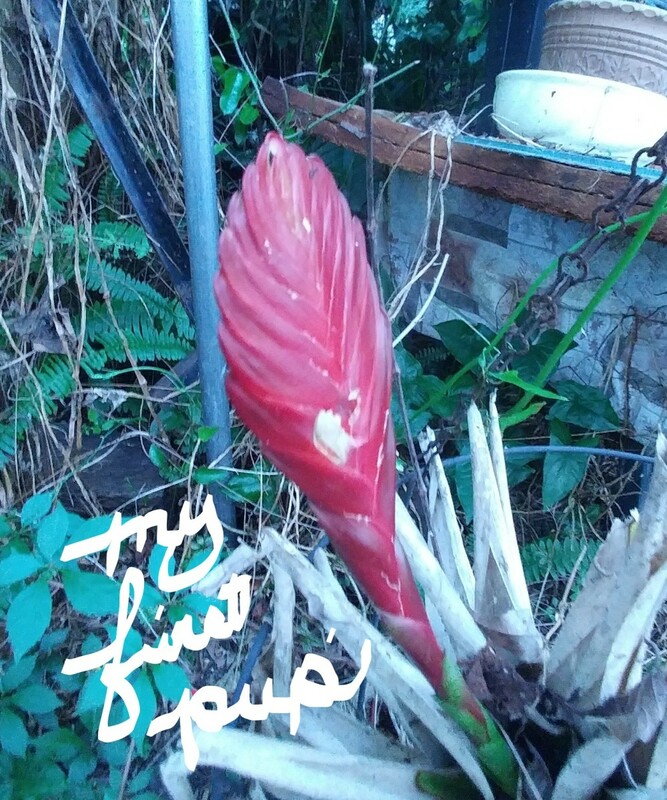 The cold killed several of my other bromeliads but this one survived and as spring has tried to emerge this baby has been presented to me. It is indeed exciting. It is with great pleasure I share her with you. 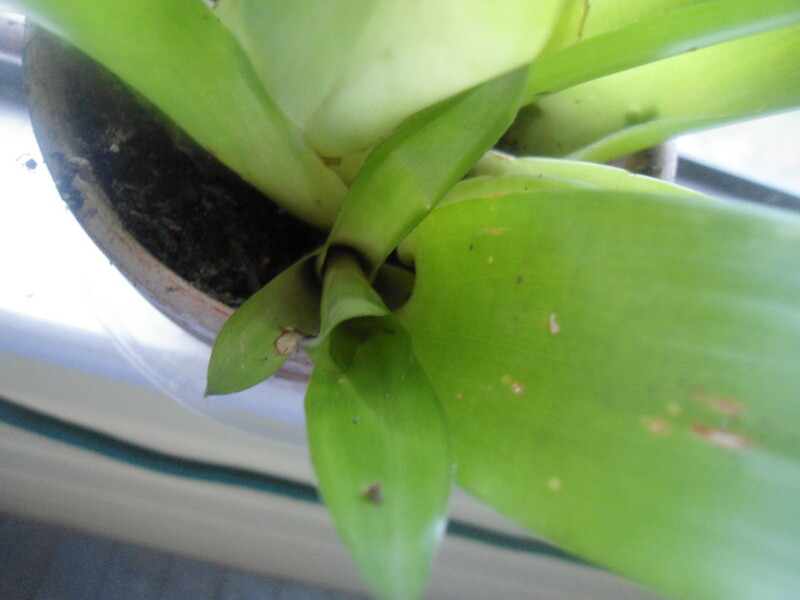 Newly added photos of the 'pups' that have been born from the Momma bromeliad are shown. I am a proud Grandma . Bromeliads are rather beautiful and mysterious. I term them exotic tropical wonder plants. they do thrive in tropical zones. That part of their description can be found when researching these plants. 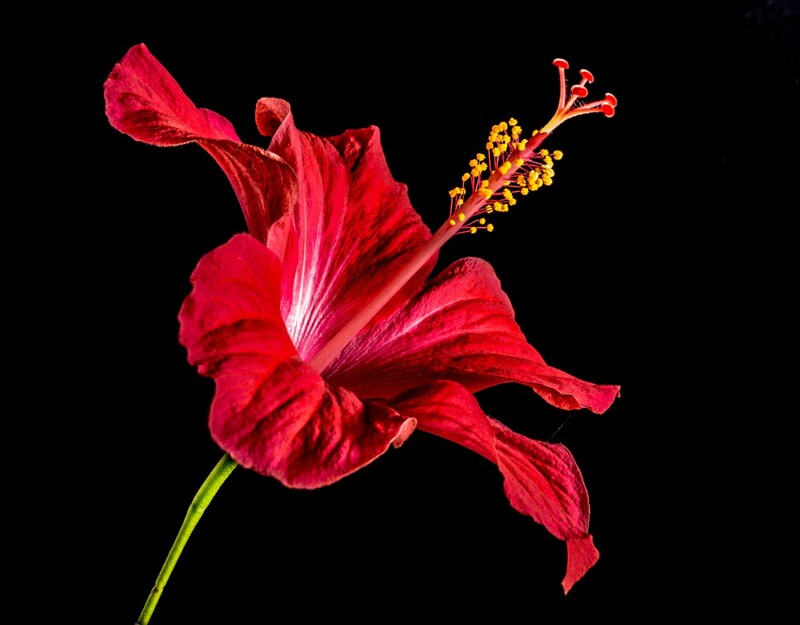 The exotic and wonder are terms that to me most accurately fill in the blanks about these unusual plants. Their forms have a range of diversity that is unexpected. By many they are known as air plants. 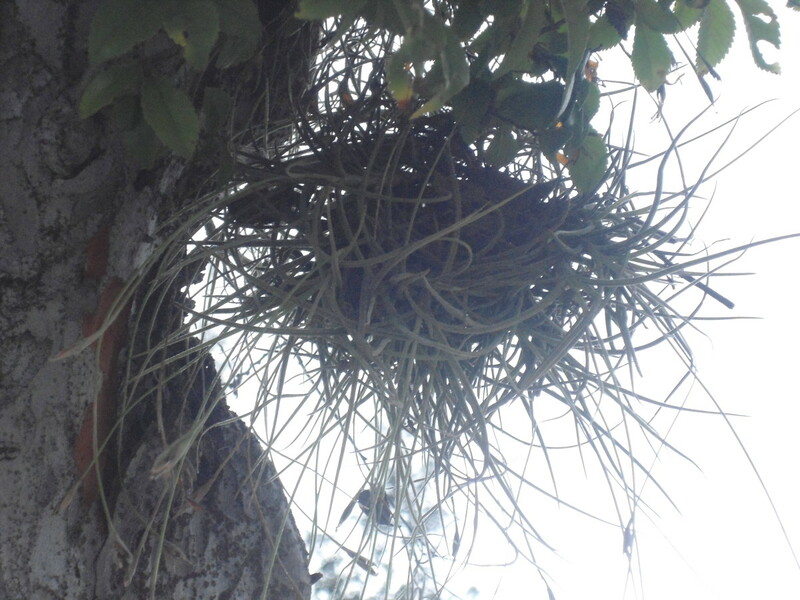 The more correct term is epiphytes meaning they rely on perhaps a tree for physical support only. Often they are perched on a branch of tree looking quite perky but often not beautifully clothed. They just perch there on the host using that host as a place on which they can lounge around and live out its life. The most familiar one in the South can be seen in great abundance dripping down branches like icing flows down a newly baked cake that has not quite cooled. Deliciously draping itself over the awaiting resting place it now calls home. Spanish moss is its common name. It really is not showy like some of its relatives but none less catches your eye. Their little cousins which I was told from my youth were air plants resemble a head of untamed hair that is in disarray as if its owner just tumbled out of bed. Usually small clumps of these are found just carelessly hung on a branch minding its own business. 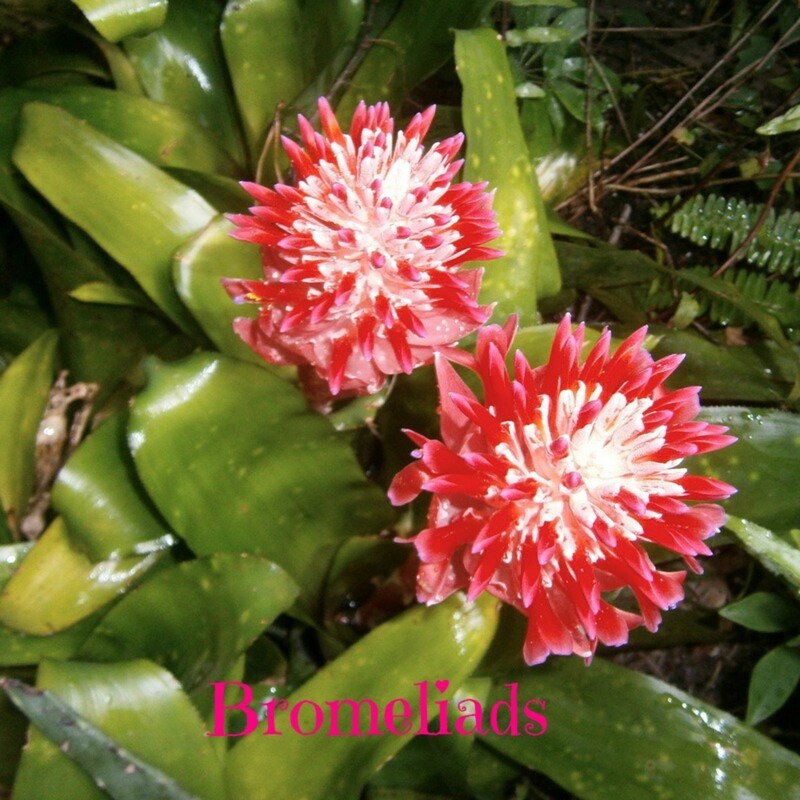 Bromeliads belong to the the Family: Bromeliaceae and the class: Liliopsida. When I read they are monocots my synapses were firing and tossing around that term. "Hey, fellas.Dig out that word. She learned that years ago.' And, as quick as lightning, I recalled that monocot means one seed leaf , one cotyledon . Thank you college Botany teacher. I did pay attention. Botany was one of my favorite classes while I was engaged in my formal education. My not so formal education has continued every day since that time. It seems that about 500 years ago Columbus discovered the pineapple on a visit to the West Indies. It was his second trip to the new world. He found the pineapple was being cultivated there and being intrigued by it gathered up some and returned with them to Spain. 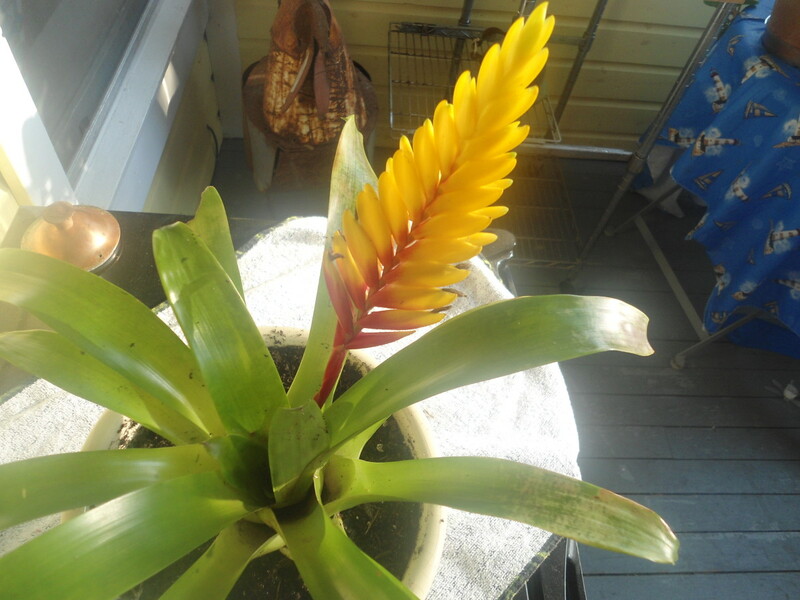 My bromeliads are finished blooming and now busy making 'pups.' They are not quite large enough for you to see the pups yet but when they are, I will post a photo or two of them. Jpcmc, tattookitty, and seh1101 all have shared information on tropical plants. 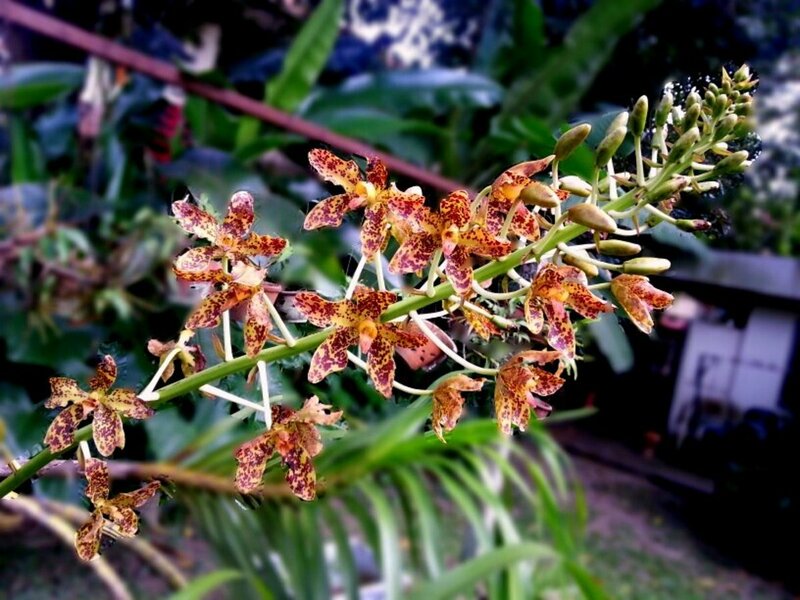 Jpcmc has shared how to care for Anthruiums and included photographs of these amazing plants. These are a plant you will want to have in your home. 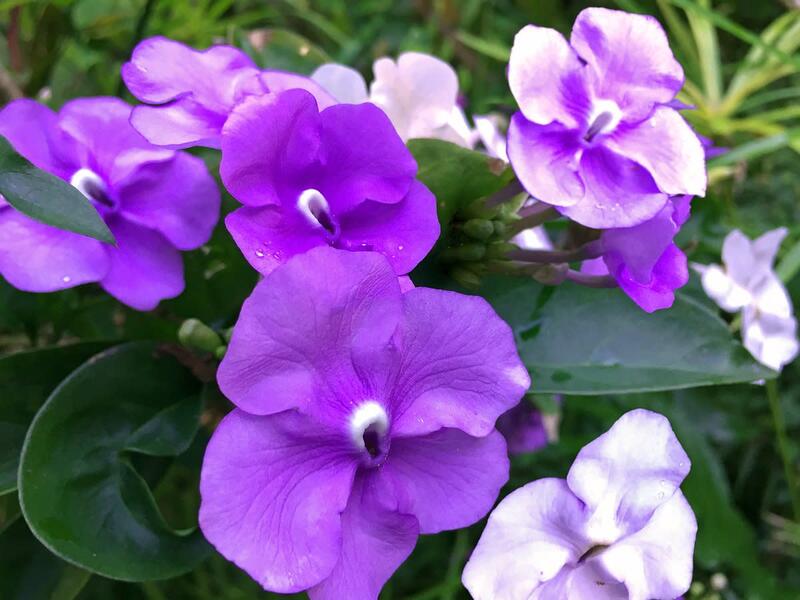 TattooKitty has shared with us some of the fragrant and lovely flowers of Hawaii many of which inspired perfume scents. 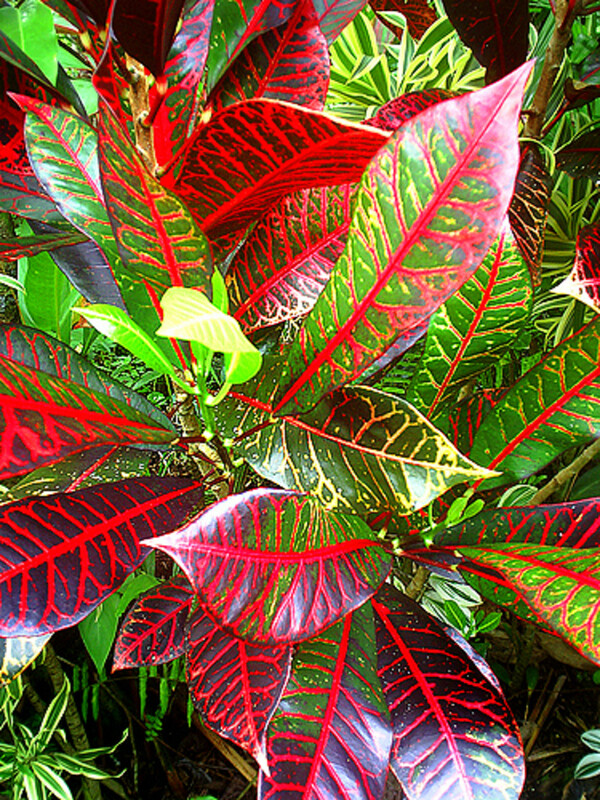 Many of these plants will thrive in locations outside of Hawaii which is good news for us. Seh1101 has written about and given us a number of photographs of the Datura. It grows to be quite breathtaking. This exotic tropical wonder plant appears on trees and logs awaiting some would be passerby to spy them in all of their glory They are not pretentious nor obtrusive. Their quiet beauty is enough to cause the interloper into their world to pause and gaze if for but a moment. They range from tiny little wisps of plant material to long-leafed plants with a beautiful center that seems surreal at first glance. The pineapple is one member of this group that we are very familiar with. They are prickly little critters that hold a lovely treat within that coarse exterior. 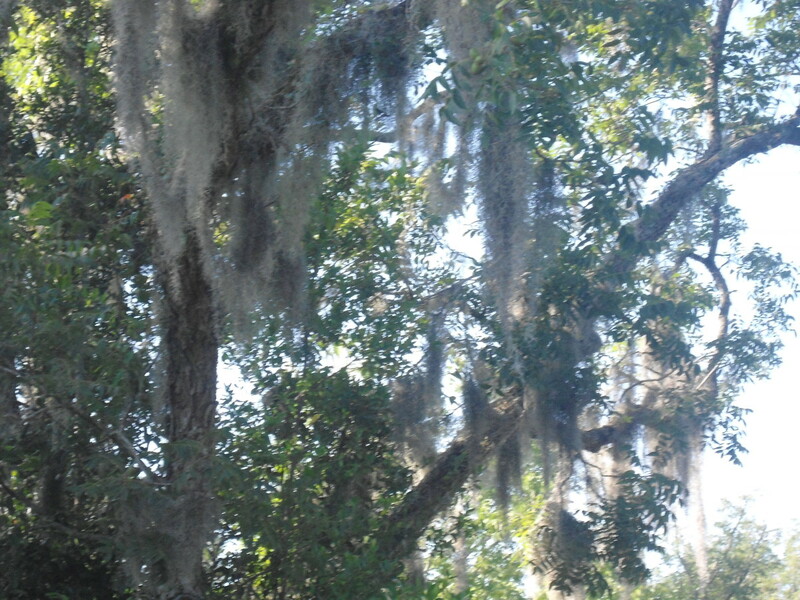 It's cousin, Spanish moss, has been center stage in many movies set in the South. The mystery and eerie feeling that it creates adds leaves no need for words. Surely lurking behind the curtain of moss yet undiscovered secrets await. 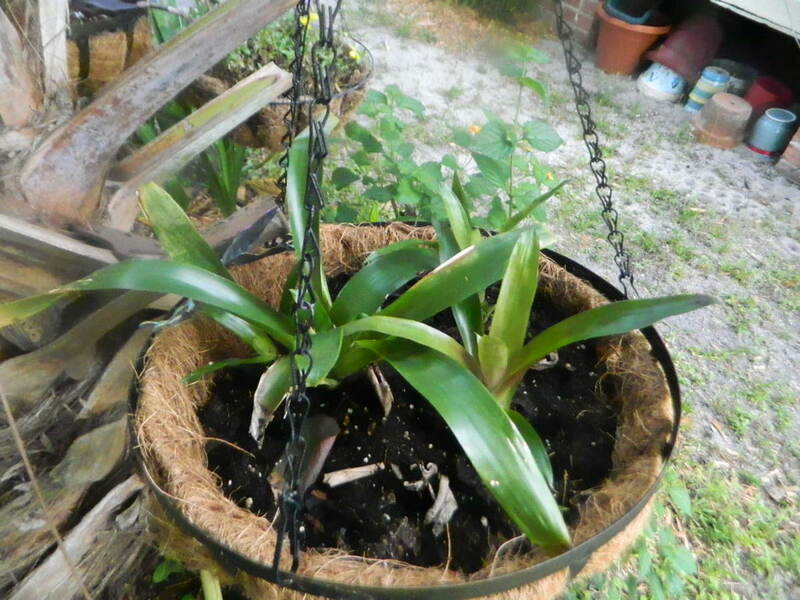 If you plan to grow bromeliads out of doors, you will want to be aware of their sensitivity to cold. Provided for you here is some information you will find helpful. The following information concerning bromeliad sensitivity is from an article by Dale Jenkins from the Florida Bromeliad Society which was published in 1998. At the link provided there is also one that was published in 2007. This information will be of value if you are a novice bromeliad grower as I am. http://fcbs.org/articles/ColdHardyBroms.pdf Because the lists contained within the article are very long I have provided the link so you can peruse the information as desired. Exotic and alluring, the bromeliad often grows in a rosette design. 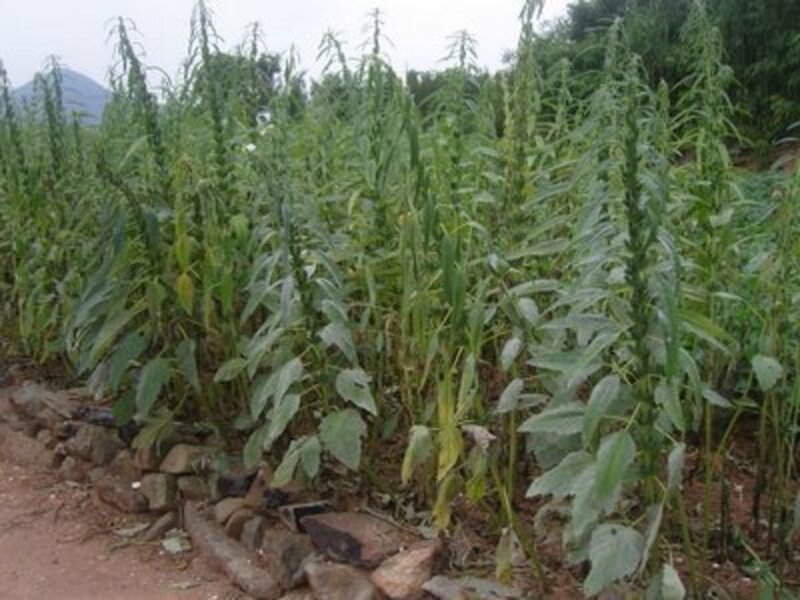 The leaves are large and often have spines which can be prickly. in nature they often are seen clinging to a tree branch or log via their roots. The cup-like design catches water and nutrients which provides nourishment for it. 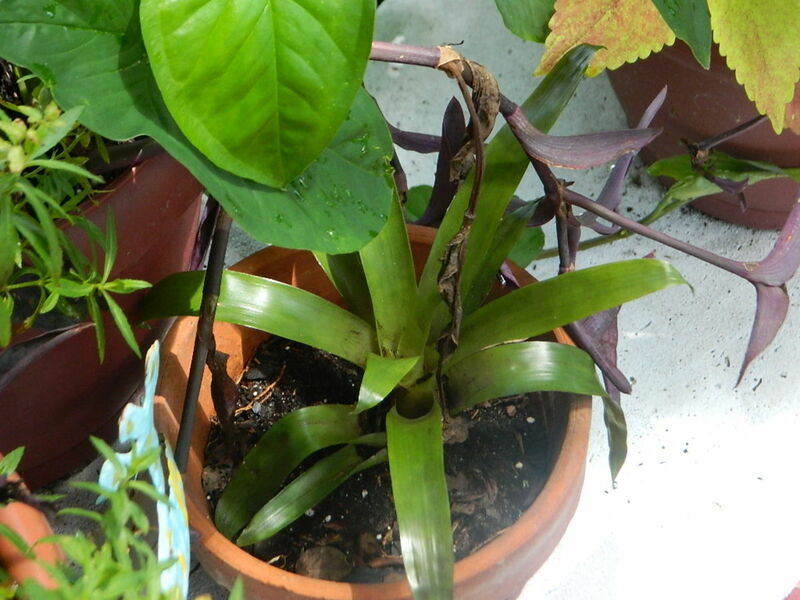 Bromeliads are an excellent breeding ground for mosquitoes. The leaves are shaped to hold water in which larvae will grow and multiply. It is suggested by the Pinnellas County Public Works that you can check for yourself to determine if they have taken up residence in your plants. Scoop up some water in a clear container. If you can see small pale worm like critters swimming within the water they are mosquitoes waiting to grow up. Use Bti which is effective for three weeks.Bti is is formally known as bacillus thuringiensis israelensis. Interestingly enough it is a bacteria that will infect and kill mosquito larvae. It is very selective and kills only mosquito larvae, gnats, and black flies. It is said not be harmful to other insects, birds, fish, or mammals. 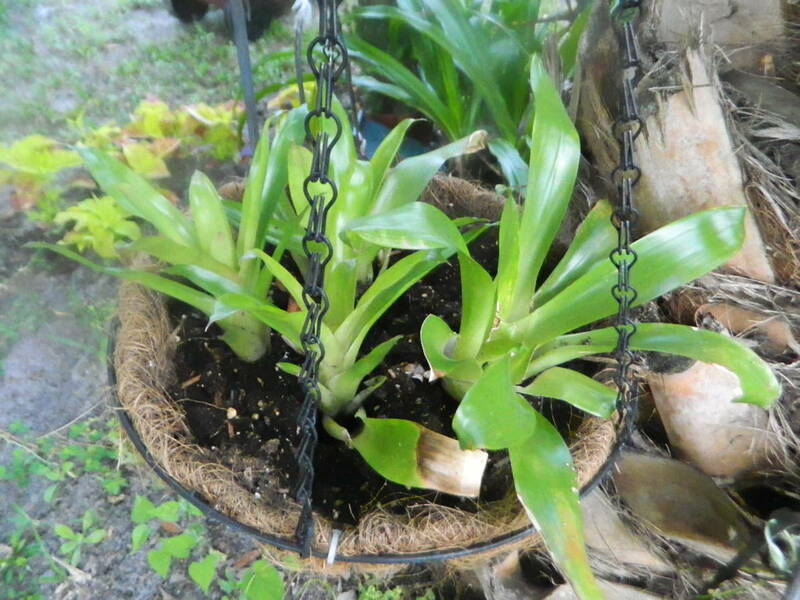 It is also recommended that a fertilizer that is safe for bromeliads be used. It will not provide nutrients for the mosquito larvae. More information about the fertilizer can be found in the Pinellas county article. http://www.pinellascounty.org/PublicWorks/mosquito/pdf/bromeliads-and-mosquito-control.pdf More information on this topic is found at this Pinellas county site. Is there a plant that thrives in tropical plants that you have grown? Perhaps you can share a bit in the comment section. Yes, I have and it is very exciting. Most only bloom once; after that time, they focus all of their energy into forming 'pups' which are new plants. 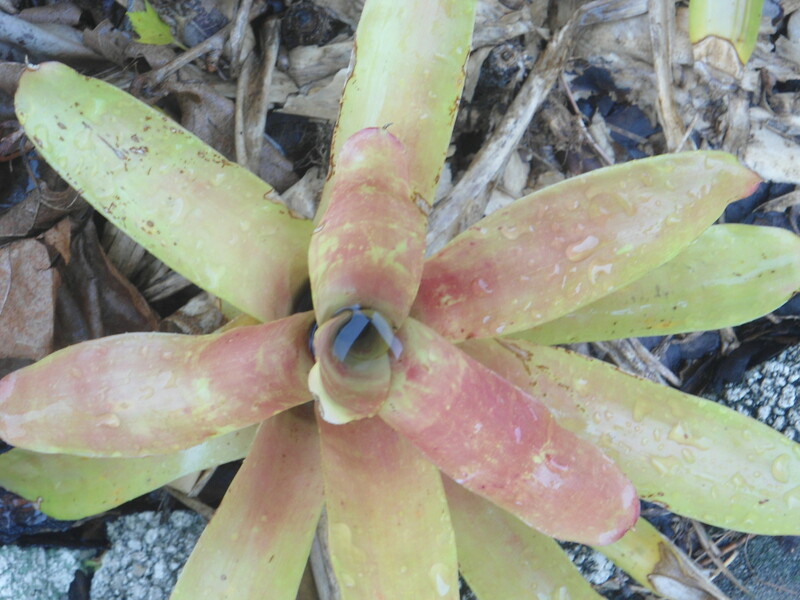 Bromeliads like the warm humid climate especially found in South Florida but can survive long periods of drought. They thrive mainly in South Florida in the hammocks and swamps where tropical conditions prevail with more constancy. 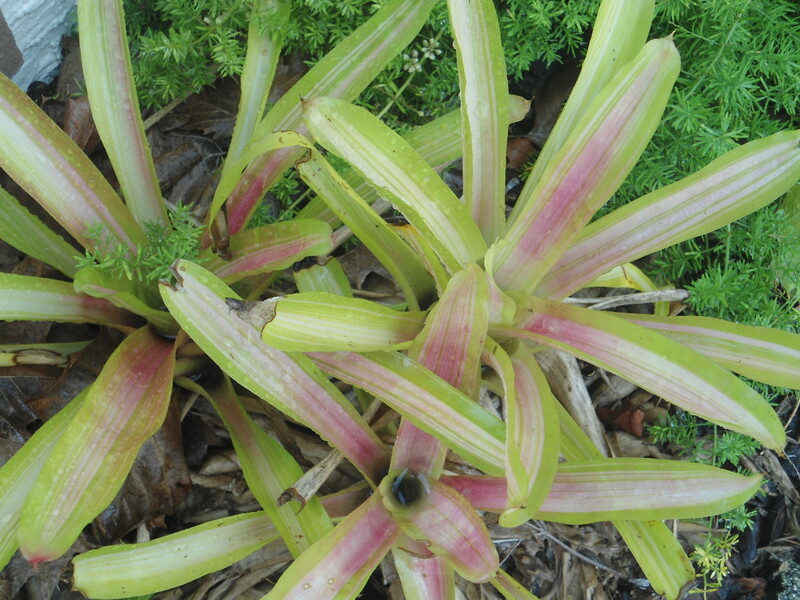 Sadly some of Florida's natural bromeliads are being attacked by a weevil. Research is being conducted to determine how best to control this issue of concern. How frequently to water them seems to be a matter up for debate. One source says three to four times a week another says once a week. I suggest you be vigilant at first and strike a happy medium. Plants tend to let us know when they need something. The Bromeliad Society offers this hint when it comes to determining need for light: soft leaf/soft light; hard leaf/ hard light. Which of course means, shady for soft leaves and bright/filtered light for hard leafed plants. An interesting tidbit reported in one of the many sources I read is that some are carnivores. Be wary, little insects, where you land. This brief introduction may lure you into the world of the bromeliad. 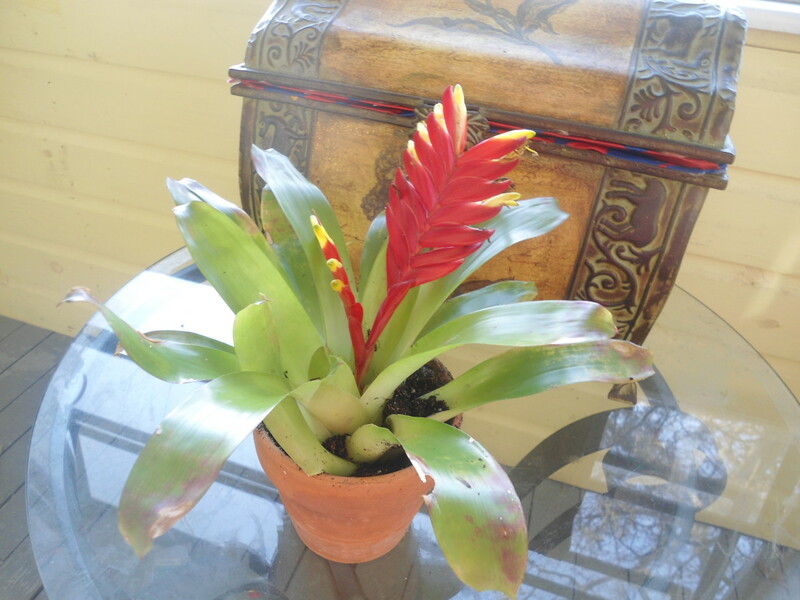 I currently have one bromeliad plant in bloom indoors. We often see those little air plants which you showed in a photo in many places. I have even found some in our yard. 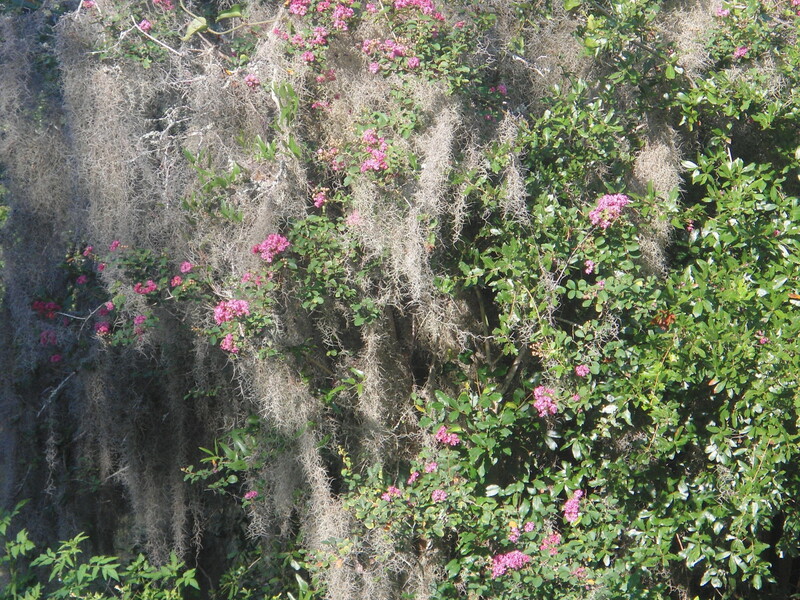 We also see lots of spanish moss in our area. These types of plants are certainly interesting and beautiful when in bloom. Yes even here in Florida in winter mine are inside. And it is so cool that we can have an abundance of them inside when the need occurs. It sounds as though you enjoy yours and much as I do mine. Coming from Britain, most bromeliads can only be grown inside in the winter to keep them frost-free. I've kept a few of the larger species in the past, including pineapples, but my 'speciality' is the small air plants known as Tillandsias. The advantage of these little plants is that a large number can be kept in a small area - I have about 20 different kinds in a tray about 2 ft square. They don't need soil, so I've attached them to pieces of bark. The biggest problem is that they have to be kept humid, so a regular spraying - preferably with rainwater - is required. 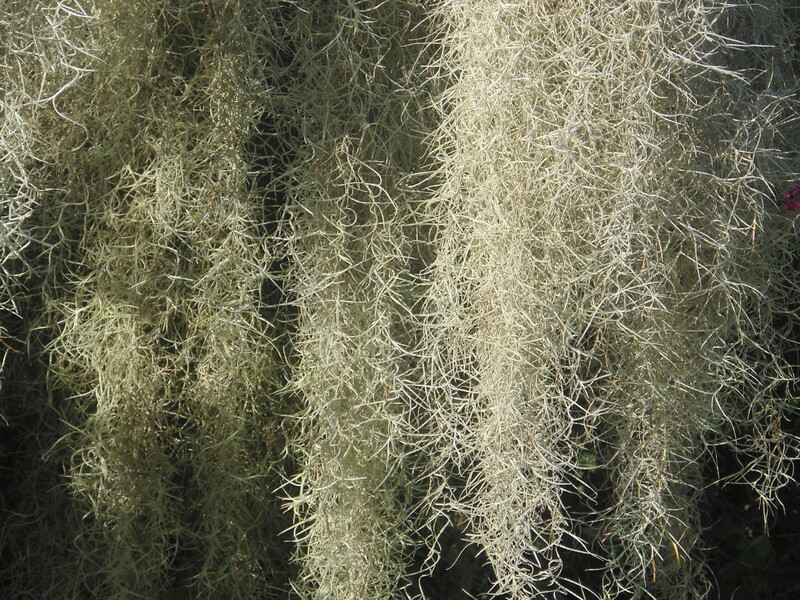 The most famous member of the Tillandsias is - Spanish Moss! I'd seen this growing in Florida, without ever being able to obtain it at home. But just recently (2015) I managed to buy some at a garden centre in England to make my collection complete! Yes, I did too. I am anxious to get started. I have a porch full of interesting plants. I have to watch them as my baby grandboy sometimes likes to prune them for me. Bromeliads are interesting and lovely and I am adding them as I go along. Thank you again for stopping by. 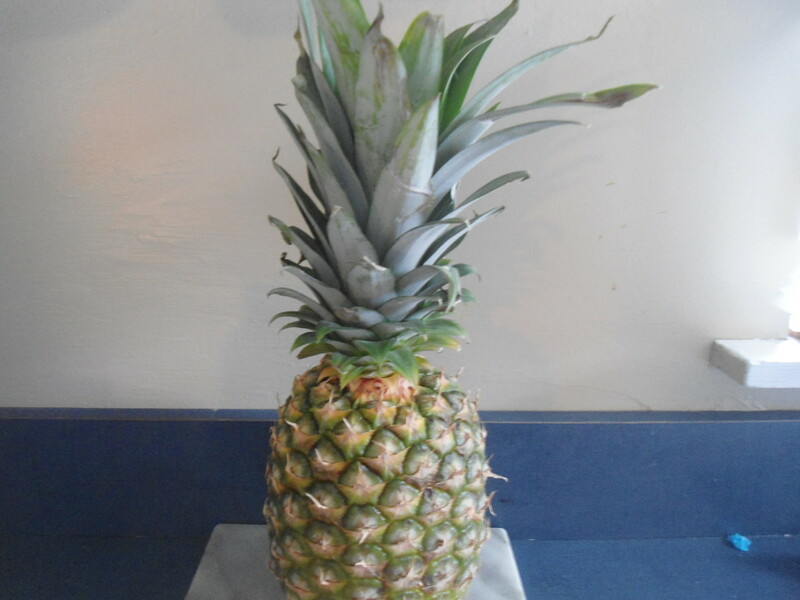 very neat , I learned something the other day about the pineapple too how to plant one you get right from the store,now to just get to the store to get one ,voted up .. jpcmc...Hi...They are interesting plants for sure. And yes those pesky mosquitoes can be a problem but there are ways to manage them as I learned when I first decided to add them to my garden. We have enough of a problem this summer with mosquitoes without adding more. So nice to see you stop by. I have read a number of your hubs in the gardening section and have found some lovely plants I am interested in adding to my collection. This is really informative. Although bromiliads do retain water which potentially can cause mosquito problems, there ar some solutions. One of my favorite is to plant citronella plants near your bromiliads. Citronella plants have anti-mosquito properties. Horsemint is another plant you can use. So use your imagination and try to landscape your garden with this in mind. Hi, sgbrown.. They are such interesting plants. I had seen them many times but never really knew just what they were all about. I am anxious to add others especially to my yard. My whole attitude about acquiring new plants is to try, try again. If I am not successful with my first try, I ask around and find out why and what I can do to do it the right way. So glad you found this o pinterest. You have a lovely day ...it is the wee hours right now when it is calm and peaceful. Hi Arlene V Poma..that is good to know. I am learning so much about them. I am anxious to grow some outside as well. It will also be exciting to have pups. Thank you for sharing and for stopping by. I've had these plants for years, and have transplanted their pups over and over again. They are so easy to grow, and when they flower, there's nothing that could compare. I live in California, and my plants are on my patio all year round. I would recommend these plants to any gardener. Great for any skill level! 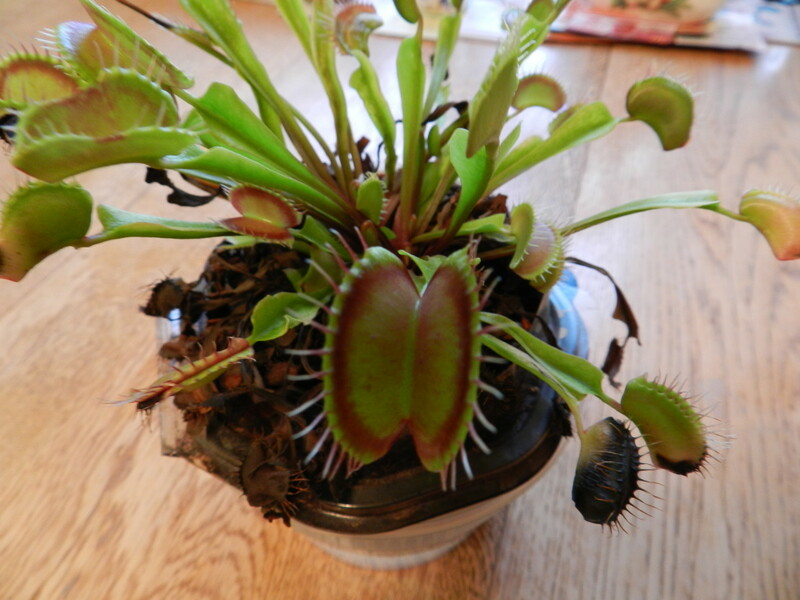 Hi, Madhatter99...These plants really are interesting and there is so much more to be said about them. Bromeliads are made up of such a variety of plants that a green house, back porch, or yard could be over flowing with them. Thank you for stopping by again. It is always nice to 'see' you. Hi, ignugent17...thank you for stopping by. I have had so much fun learning about these plants. My yard is full of Spanish moss which I have always adored. 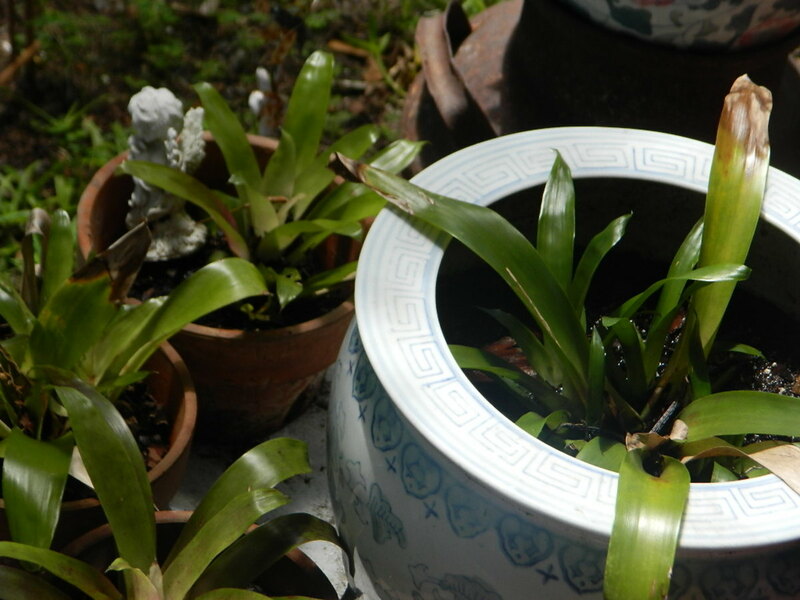 I hope to add outdoor bromeliads as well and hopefully will be able to control the mosquitoes. I will be over to visit soon. Thanks for all the wonderful info pstraubie48 you have done your research lovely pics too I am voting you up! take care. Thank you, ignugent17, for stopping by. These really are amazing plants. My Mother used to raise them when we lived south of where I now live. She could make sticks grow. I am a novice. I hope that my plants turn out to be as much of a success as hers were. You know our Mothers know how to set the bar high. Thanks for the vote up. Very beautiful flower and it is easy to grow too. Thanks for all the information you have provided. Very interesting and useful. Voted up.